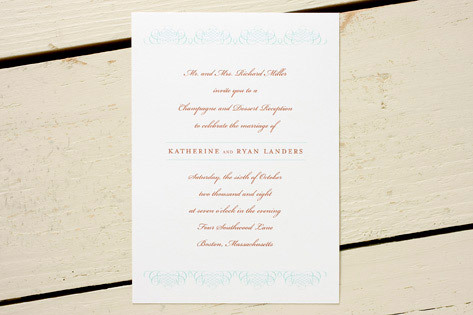 Ornate, repeated flourishes frame this wedding invitation with elegant sophistication. The bride and groom's names stand out in a classic serif face (Mrs. Eaves), while the rest of the event's details flow elegantly around them. Available in pool blue/chocolate brown (shown), medium pink/chocolate brown, and sage green/chocolate brown.